Sidney native Travis Hoewischer is the host of “Laff Raffle for the Arts” fundraiser on April 13, which will raise funds for the Sidney Historic Theatre. SIDNEY — Raise the Roof for the Arts presents the first annual Laff Raffle for the Arts, A Comedy Show! Give. Get-Back. The laughter begins April 13 at 7 p.m. The evening of stand-up comedy featurrs comics from around the country. • Justin Golak, who Columbus Alive newspaper’s 2012 entertainer to watch. Golak has taken stages across the country. “Everyone loves a good laugh, but how much better is your night when you have a chance to come home with some money in your pocket and the feeling that you’ve helped impact the community? You give and you get back. It’s perfect,” said Hoewischer a 1998 Sidney High School graduate. 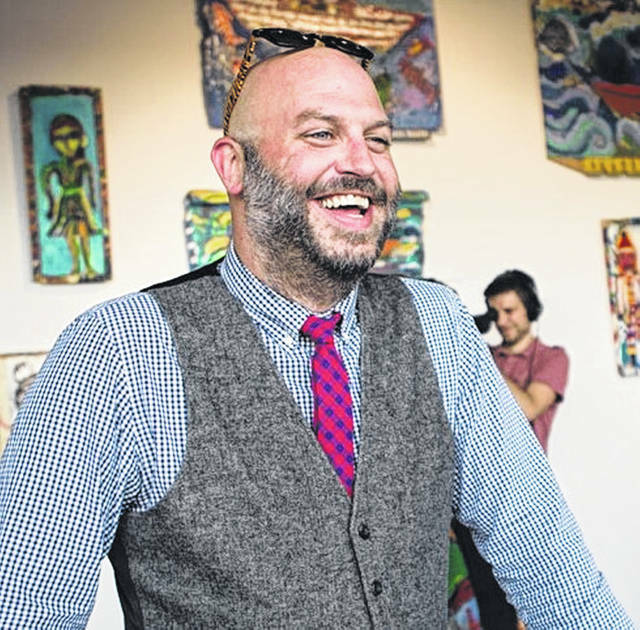 He modeled the show after the old 50/50 raffles from numerous Shelby County festivals and sporting events, borrowing some hometown creativity to engage new comedy audiences. The audience will watch the comics “bring the funny” from around the country. Those purchasing a ticket will also have a chance to win back more than their admission price in one of the evening’s split the pot drawings. Each ticket purchased gets the ticket holder more than just an evening of comedy and a chance to support the operation and restoration of the Historic Sidney Theatre. They also get one entry into the four raffle drawings on the evening. Additional split the pot raffle tickets can be purchased during the event. A cash bar with beer, wine, signature cocktails, non-alcoholic beverages and snacks will be available. Doors will open at 6 p.m. for a pre-show cocktail hour and theatre tour, given by Raise the Roof for the Arts Executive Director,Ian Hinz. “Come early for the guided tour stay late for the laughs. We hope to see you at the first annual Laff Raffle for the Arts,” said Hinz. Single tickets are $20 and Limited reserved table seating is available for $100 per table (seats four). Tickets are available online at www.sidneytheatre.com, by calling 937-498-1921, or in person at the box office located at 120B W. Poplar St., Sidney, Monday to Friday, 1 to 5 p.m.
https://www.sidneydailynews.com/wp-content/uploads/sites/47/2019/04/web1_Travis-Hoewischer-Vol-5-91.jpg.jpegSidney native Travis Hoewischer is the host of “Laff Raffle for the Arts” fundraiser on April 13, which will raise funds for the Sidney Historic Theatre.